Tending to disturb or cause disturbance. disquieting, unsettling, worrisome, troubling, unnerving. depressing, harrowing, horrifying, poignant, threatening, problematic, awkward, objectionable, questionable, alarmist, concerning, disgusting, disturbance, boring, dubious, worried, scandalous, dire, dramatic, nuisance, restless, astonishing, grave, unsettled, sinister, terrible, unstable, inappropriate, precarious, disagreeable, devastating, anxious, insecure, undesirable, uncanny, disastrous, interesting, damaging, unwelcome, unsatisfactory. 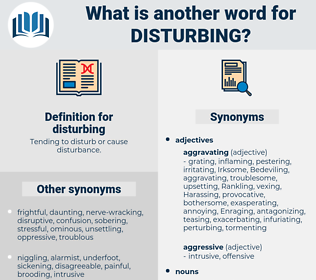 Distorting, Obstructing, diminishing, Jeopardizing, Discontinuing, Endangering, undermining, impeding, Bothering, impair, Impairing, Interrupting, interfering, Displacing, intruding, inhibiting, hindering, Contravening, stopping, worsening, seriously, Infringing, Derailing, Terminating, stirring, eroding, Harassing, Hampering, Harming, Suppressing, Afflicting, affecting, prejudice, Prejudicing, Violating, troubling, Bedevilling, Destroying, sabotaging, Influencing, altering, suffering, reassuring, compromising, Preventing, impinging, Breaching, Suspending, encroaching, Modifying, Impacting, tampering, bugging, complaining, relocating, blocking, halting, allocating, shake, shaking, Attaining, Besetting, Realizing, amend, Amending, shifting, alarming, traveling, travelling, moving, stroking, mixing, Wagging, attacking, asking, Plaguing, upsetting, jamming, changing, waving, Placing, confusing, Preoccupying, depressing, haunting, concerning, disturbance, devastating, damaging. distressing, disconcerting, disruptive, irritating, alarming, Distracting, disturbed, frightening, troublesome, embarrassing, shocking, upsetting, annoying, confusing, ominous, startling, Preoccupying, uncomfortable, puzzling, sobering, disappointing, intrusive, perplexing, galling, appalling, nagging, grim, daunting, serious, troubled, frustrating, outrageous, distressed, uneasy, staggering, inconvenient, unpleasant, concerned, eerie, scary, dangerous, terrifying, regrettable, unfortunate, striking, exciting, chilling, upset, weird, sad, painful, pressing, baffling, tragic, severe, strange, ugly. easy, comforting, nice, encouraging, auspicious, pleasant, delightful, agreeable, pleasing, happy, good, helpful. inviting, peaceful, consoling, quiet, settling, tranquil, light, lulling, pacific, convenient, reassuring, restful, comfortable. She decided to send him to the principal for disturbing the class, hoping to get an answer. His lordship and the gentlemen was playin' cards in the smoking - room, and as soon as I could do so without disturbing 'is lordship, I give him the party's card.